(These guidelines are for corporate taxpayers.For general guidelines on filing your income tax return, go here. and one held by the Tax Filer. character (including comma or period) shall occupy one box. period, there is NO NEED to leave blank after the comma or period. shall occupy one box and leave one space blank for every word. after the comma or period. replicated/transferred to the applicable PART/schedule. 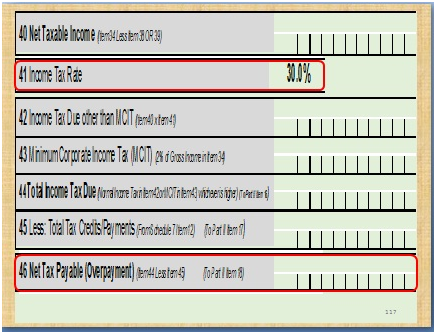 Taxpayer Subject Only to REGULAR Income Tax Rate of 30%. Accomplish first the applicable schedules before accomplishing Parts II to V.
divided into Parts I to VI with accompanying Schedules 1 to 13.
calculations are provided on each line item. transfer the applicable information from Part IV to each of the items. instructions as to the source of the information and the necessary calculations are provided on each line item . 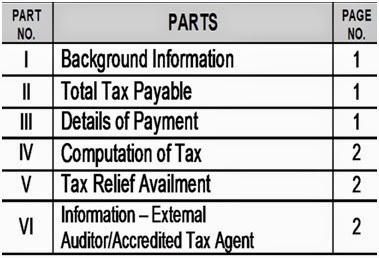 of Gross Income under Section 34(L), NIRC, as amended by RA 9504.
andconsistently applied throughout the year. to the Bureau in accordance with Secs. 57 and 58 of the Code. in cases where no withholding of tax was made in accordance with Secs. 57 and 58 of the Code. 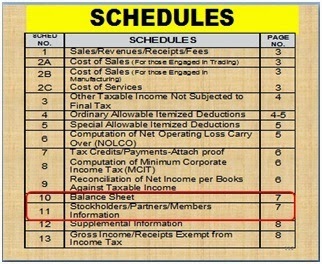 Indicate the amounts as shown in the Audited Financial Statements. under the SUPPLEMENTARY INFORMATION PORTION of the said forms will be OPTIONAL. No. 2307 and other pieces of evidence for final taxes withheld. said taxpayers should properly receipt and book their TAX-EXEMPT INCOME. Free Legal Assistance under R.A. 9999, etc. quarterly sales, earnings, receipts or output exceed P 150,000). (SMR) for Annual Income Tax Return. subjected to Withholding Tax (BIR Form No. at Source (BIR Form No. 2307). and the return previously filed. Withholding Tax at Source (SAWT), if applicable. Form No. 2307 and other pieces of evidence for final taxes withheld. Yes. I hope you also share about the how to for self employed individuals. Your readers really appreciate your sharing these info. Many say that people are not as informed about how to do these legal things. I'm trying to fill out the interactive ITR form (followed your link) but it seems that there are some info that I don't know what to answer (like RDO code). Panu po ba kukuha ng kopya ng ITR na nawala. Ano.po bang proseso nito? how to file annual tax return for single proprietorship if there is no transactions for the whole year and what are the attachment for filling it.